Graded MINT 9 by BGS, with signature graded "10" by Beckett. A Rookie Card collectible. The Stanley Cup Champion and perennial NHL All-Star has placed a vibrant, blue ink signature on the obverse of this "The Cup" entry. The card's design also incorporates a multi-hued "4 Color" swatch taken from a jersey worn in game action by the Capitals star. 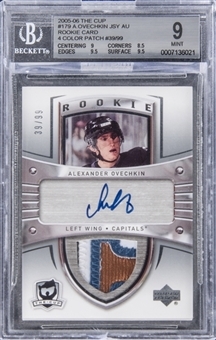 Only 8-9 of ALL of Ovechkin’s Cup Rookie Cards are 4 Colors, the majority of them (77 copies) being 3 Colors. This is one of just two letter patches in a 4 Color. (The 4 Colors can always be distinguished by the blue and copper colors, only seen in the 4 Colors, unlike the more common tan, black, and white within all of the 3 Color patches. 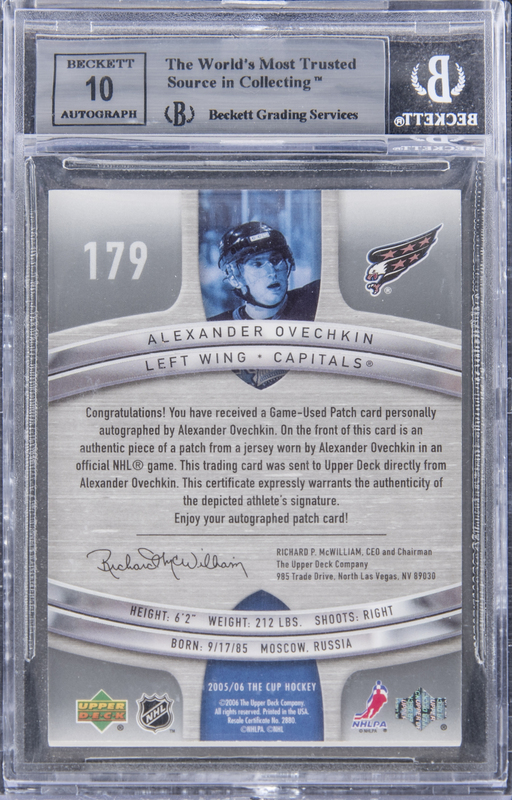 This can be verified through a Google search of Ovechkin Cup archives, which will reveal almost every Ovechkin Cup card of the 99 copies produced.) The card's BGS condition report: Centering 9, Corners 8.5, Edges 9.5, Surface 9.5. A congratulatory statement from Upper Deck appears on the card's reverse side; this declaration attests to the signature's authenticity, verifies the origin of the card's "patch" component, and serves as the COA for the subject item. The limited-edition piece is serial-numbered "39/99." The last 4 Color Ovechkin Cup RC sold on Ebay (02/26/2019) realized $30,099.00, and the most recently offered 3 Color BGS GEM MINT 9.5 Ovechkin sold for $22,801.00 (eBay, 03/26/2019). An extraordinary, top-level collectible of the superstar athlete, in Mint condition.